Editor’s note: This story has been updated to correct a typographical error in reference to D.C. Mayor Muriel Bowser. 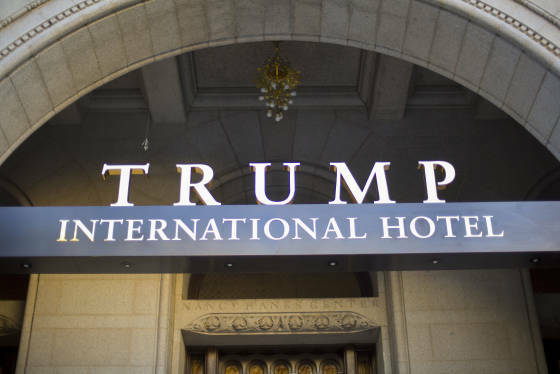 WASHINGTON — With less than two weeks before the election, Republican presidential candidate Donald Trump took time out from campaigning to officially open his new luxury hotel in Washington, D.C. a few blocks from the White House. 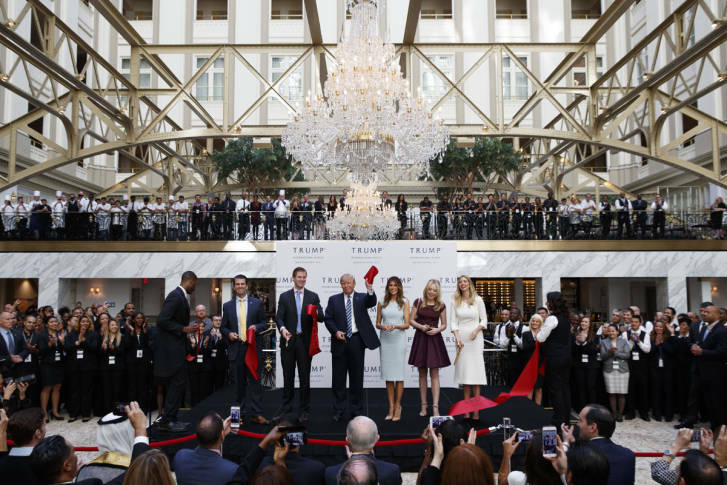 The Wednesday morning ribbon-cutting ceremony at the Trump International Hotel on Pennsylvania Avenue was billed as a business trip. But a political atmosphere reigned: The security was Secret Service-tight, chanting protesters swarmed the entrance outside and Trump, himself, speaking in the hotel’s “presidential ballroom” shortly after 11 a.m., turned his development of the “most coveted piece of real estate in Washington, D.C.” into a pitch for running the country. The Washington Post’s Fact Checker looked into the truth of the “under budget, ahead of schedule” claim and found the issue too murky to make a declaration one way or the other. The hotel had what’s known as a soft opening last month. Trump’s daughter, Ivanka, who has played a key role in his presidential campaign, also spoke at the ceremony. The ceremony also drew protesters to Pennsylvania Avenue, upset with remarks Trump has made on the campaign trail about Muslims, Hispanics and women. Dozens of protesters affiliated with Unite-HERE, a union that represents hotel and hospitality workers, who chanted and marched outside the hotel Wednesday said they’re protesting Trump’s refusal to negotiate with workers at a Las Vegas hotel he owns who voted to form a union. One local D.C. official who didn’t attend the ribbon-cutting was Mayor Muriel Bowser. She joined Trump for the groundbreaking ceremony, held before Trump announced his candidacy, but won’t attend the grand opening. Instead of the grand opening, Bowser, a Democrat, planned to attend a ceremony marking the transfer of the Army’s former Walter Reed campus to the city, which will be redeveloping the property with a mix of housing and retail. WTOP’s Neal Augenstein, Kate Ryan, Megan Cloherty, Jack Moore and The Associated Press contributed to this report.